Jean-Marc Dewaele is Professor of Applied Linguistics and Multilingualism. He is former president of the European Second Language Association (2007-2011), former Scientific Commissions Coordinator on the AILA Executive Board (2002-2005) and AILA Research Network Coordinator (2005-2008), former Convenor of the AILA Research Network Multilingualism: Acquisition and Use (2005-2011, 2014-2017) and President of the International Association of Multilingualism (2016-2018). He has served as Co-Editor of AILA Review (2002-2005), Assistant Editor of the International Journal of Bilingualism (2006- 2012), Reviews Editor of Sociolinguistics Studies (2006-2010) and the International Journal of Bilingual Education and Bilingualism (2010-2012). He became General Editor of the International Journal of Bilingualism and Bilingual Education in 2013. He has published a monograph "Emotions in Multiple Languages" in 2010 (2nd edition in 2013). His research covers individual differences in psycholinguistic, sociolinguistic, pragmatic, psychological and emotional aspects of Second Language Acquisition and Multilingualism. He was recipient of the Equality and Diversity Research Award from the British Association for Counselling and Psychotherapy (2013) and the Robert C. Gardner Award for Excellence in Second Language and Bilingualism Research (2016) from the International Association of Language and Social Psychology. Livia Dewaele is currently a second year BA student at Worcester College, University of Oxford where she reads French and linguistics. She has co-authored two papers on Foreign Language Enjoyment and Anxiety. She is a keen rower in her College and University teams. The combined effect of positive and negative emotions in Second Language Acquisition (SLA) has attracted the attention of researchers influenced by the Positive Psychology movement (Dewaele & MacIntyre, 2014; 2016a). The current study is based on a pseudo-longitudinal design to investigate how the positive and negative emotions of 189 foreign language pupils in two London schools evolved over time. A comparison of the mean values of Foreign Language Enjoyment (FLE) and Foreign Language Classroom Anxiety (FLCA) among 12–13 year olds (age group 1), 14–15 year olds (age group 2) and 16–18 year olds (age group 3) showed little variation in FLCA and a slight increase in FLE. Multiple regression analyses revealed that fewer independent variables (learner-internal and teacher-centred variables) predicted FLE and FLCA at the start and at the end of the secondary education compared to the middle phase. These findings suggest that the causes of positive and negative emotions are dynamic and change over time. Moreover, the nature of the relationships changes. Dörnyei and Ryan (2015) expressed their surprise at the relative lack of Second Language Acquisition (SLA) research into the full range of emotions that learners experience in the classroom. They blamed the cognitivist origins of SLA research and exhorted researchers to overcome this “emotional deficit”. They acknowledged the existence of research on learners’ foreign language anxiety (Horwitz, 2010) and its negative effects on SLA and heeded the call issued by Dewaele and MacIntyre (2014) to also systematically include positive emotions in research designs (p. 205). While some early SLA researchers (Dulay & Burt, 1977; Gardner, 1985; Krashen, 1982; Schumann, 1978) acknowledged the role of positive emotion in SLA, it was never in a prominent position as it was buried inside constructs like the motivation or acculturation models. Much more research has been carried out into negative emotions, mostly foreign language anxiety. Many language educators are aware of the importance of improving individual learners’ experiences of language learning by helping them to develop and maintain their motivation, perseverance, and resiliency, as well as positive emotions necessary for the long-term undertaking of learning a foreign language. In addition, teachers also widely recognise the vital role played by positive classroom dynamics amongst learners and teachers, especially in settings in which communication and personally meaningful interactions are foregrounded (MacIntyre & Mercer, 2014, p. 156). Dewaele et al. (2017) investigated the effect of learner-internal variables and FL teacher-centred variables on the levels of FLE and FLCA of their 189 British pupils from two London secondary schools. The authors considered the static effect of the various independent variables on the whole cohort of pupils aged 12 to 18. The argument is that different variables (e.g. motivation to learn a language, success in learning a language, contact with a language) do not have a fixed effect, but that they interact and that that interaction itself changes over time, so not only do motivation and success interact, but this interaction changes as well (p. 126). We argue that the same applies to FLE and FLCA. Re-using the data set from Dewaele et al. (2017), we will adopt a pseudo-longitudinal design1 to look how FLE and FLCA evolve by comparing different age groups and establish how the interactions between various independent variables and the dependent variables change over time. The original definition of foreign language (classroom) anxiety (FLCA) hints at the complexity of the concept: “a distinct complex of self-perceptions, beliefs, feelings and behaviours related to classroom learning arising from the uniqueness of the language learning process” (Horwitz, Horwitz & Cope, 1986, p. 128). Horwitz has repeated that the concept of anxiety is “multi-faceted” (2010, p. 145). She explained that learners who experience FLCA “have the trait of feeling state anxiety when participating in language learning and/or use” (Horwitz, 2017, p. 33). Taking a slightly broader perspective, MacIntyre (2017) insisted that language anxiety “is influenced by internal physiological processes, cognitive and emotional states along with the demands of the situation and the presence of other people, among other things, considered over different timescales. Anxiety has both internal and social dimensions” (p. 28). The idea that negative emotions interfere with L2 development is not new: Krashen (1982) argued that every learner has an affective filter that determines “the degree to which the acquirer is ‘open’” (p. 9). Negative emotions push learners to bring the filter “up”, reducing their understanding and processing of language input. To bring filters down, teachers were encouraged to try to spark interest, provide low-anxiety environments, and bolster learners’ self-esteem (Krashen, 1982, p. 10). Schumann’s (1978) acculturation hypothesis for SLA was based on a similar idea. He argued that sufficient contact and social integration with the target language group would enable a learner to process and absorb the target language (TL) if “he is psychologically open to the TL such that input to which he is exposed becomes intake” (p. 29). Positive Psychologist Barbara Fredrickson explained that negative emotions such as anger lead to the urge to destroy obstacles. However, positive emotions can “broaden people’s momentary thought-action repertoires and build their enduring personal resources, ranging from physical and intellectual resources to social and psychological resources” (Fredrickson, 2003, p. 219). MacIntyre and Gregersen (2012) introduced the concepts of Positive Psychology into SLA, pointing out that positive emotions are much more than pleasant feelings: learners in the grip of positive emotions are better able to notice things in their classroom environment and become more aware of language input which allows them to absorb more of the FL. Positive emotions can also drive out negative arousal, which is crucial because negative emotions cause a narrowing of focus and limit the potential language input. Positive emotions also have longer-term effects outside the classroom as they can make students more resilient and hardy during difficult times. Experiencing positive emotions also allows learners to take some measured risks, to explore and play, which can boost social cohesion. The researchers have further explored this avenue in a special issue (MacIntyre & Mercer, 2014) and an edited book (MacIntyre, Gregersen & Mercer, 2016). Dewaele and MacIntyre (2014) developed a FLE scale consisting of 21 items with Likert scale ratings reflecting positive emotions towards the learning experience, peers and teacher, which they combined with eight items reflecting FLCA. A moderate negative correlation was found to exist between FLE and FLCA of 1746 FL learners (from all ages and from all over the world), suggesting that they are essentially separate dimensions. Further statistical analysis revealed that a high level of multilingualism, more advanced students, who felt that they did better than their peers in the FL class, who were at university rather than at secondary school and who were older, reported significantly higher levels of FLE and significantly less FLCA. The analysis of feedback on an open-ended question from 1076 out of the 1746 participants on enjoyable episodes in the FL class showed that specific positive classroom activities could boost FL learners’ levels of FLE. These included debates, making a film or preparing group presentations. In other words, activities that empowered students, gave them a choice in shaping an activity so that it matched their immediate concerns and interests. The narratives also pointed to the crucial role of the classroom environment in the experience of FLE and FLCA. Participants reported episodes where teachers had been funny and encouraging, using humour judiciously, praising students for good performance. Sympathetic laughter (rather than mocking laughter) was particularly appreciated when used to defuse a potential embarrassment. Teachers were found to directly contribute to their students’ FLE, confirming previous findings (Arnold, 2011). Peers could also boost – or destroy – FLE. A follow-up study by Dewaele and MacIntyre (2016a) used a Principal Components Analysis of the same dataset, and revealed three dimensions explaining nearly half of the variance, and showing the independence of two dimensions of FLE, namely social and private FLE. The former accounted for 13% of the variance and the latter explained an additional 6% of variance. A final study on the same database focused on the gender differences at item level (Dewaele, MacIntyre, Boudreau & Dewaele, 2016). Female participants reported having significantly more fun in the FL class, agreed more strongly that they learned interesting things, and were prouder than the male peers of their FL performance. The female learners also tended to experience more enjoyment and excitement in a positive FL classroom environment that allowed them to be creative, and tended to agree more that knowing a FL was “cool”. However, they worried significantly more than their male peers about mistakes and lacked in confidence in using the FL. The authors speculated that the females’ heightened emotionality might boost the acquisition and use of the FL and that both emotions functioned in a seesaw manner, fluctuating quite rapidly. Dewaele et al. (2017) explored the effect of learner-internal and learner-external variables on levels of FLCA and FLE of 189 secondary school pupils in London (the same corpus on which the present study is based) who were mostly studying French, German, or Spanish as a FL. Participants reported significantly higher levels of FLE than FLCA, with a weak negative relationship between both (r = –0.194, p < 0.007), confirming the finding in Dewaele and MacIntyre (2014). Pupils’ age was not linked to FLCA but was positively linked to FLE (despite a dip among the 15-year olds). Female pupils scored higher on both FLE and FLCA. Higher levels of FLE were further linked to more positive attitudes towards the FL, the FL teacher, frequent use of the FL by the teacher in class, a strong proportion of time spent by pupils on speaking, a higher relative standing among peers in the FL class, and being more advanced in the FL. Lower levels of FLCA were linked to positive attitudes towards the FL, higher relative standing among peers in the FL and being more advanced in the FL. We were struck by the fact that FLCA is much less related to teacher and teacher practices than FLE. We thus concluded that an effective teacher with that type of students needs to fuel learners’ enthusiasm and enjoyment and not worry to about their FLCA while creating a friendly low-anxiety environment. Boudreau, MacIntyre, and Dewaele (to appear) focused on the dynamics of the FLE and FLCA adopting an idiodynamic approach. Ten Canadian English-speaking students with French as an L2 participated in the experiment which consisted of a photograph description and five oral tasks (description, two discussions, counting, giving directions). They had been asked to bring a photograph about something they found enjoyable and that was linked to an event, a memory, a hobby, a place, an activity, or a person/relationship. They discussed their photograph for three to five minutes in French after having been fitted with ECG electrodes and then proceeded with the oral tasks. Everything was video recorded. The recordings were then loaded into the Anion Variable Tester V2 software. Half of the participants began by rating their levels of enjoyment, and the other half began by rating their levels of anxiety. After completion, the data were transformed into a graph. The researcher and the participant looked at the graph together and the researcher enquired about reasons for the spikes and dips in ratings. This portion of the process was audio recorded and later transcribed and analysed in conjunction with the idiodynamic data in order to further understanding of the relationship between these two variables at a moment-to-moment level. An analysis of the data revealed a dynamic relationship between enjoyment and anxiety. Sometimes the two emotions moved in converging or diverging patterns in relation to specific events. Sometimes they operated independently of one another following unpredictable trajectories. Sometimes high levels of anxiety paired with low levels of enjoyment occured when the participant experienced frustration and difficulty with self-expression, namely vocabulary and organization of thought. This anxiety could block out positive emotions and interrupt flow and engagement. Enjoyment had a positive impact on L2 communication task performance. More enjoyable tasks promoted more interest, task engagement and flow, generated less frustration about missing vocabulary compared to less enjoyable tasks. Teachers play a central role in establishing a good emotional atmosphere and creating a true learning environment (Arnold & Fonseca, 2007; Gregersen & MacIntyre, 2014). Good chemistry among students, and between students and their teacher, as well as good pedagogical practices from the latter are crucial to boost students’ motivation levels and positive emotions (Piccardo, 2013). The FL teacher needs to support and promote group solidarity and create an emotionally safe classroom environment where linguistic experimentation is encouraged (Baider, Cislaru & Coffey, 2015; Berdal-Masuy & Pairon, 2015; Borg, 2006; Dewaele, 2015; Dörnyei & Csizér, 1998; Dörnyei & Murphy, 2003; Williams, Burden, Poulet & Maun, 2004). The positive emotional atmosphere in a FL classroom is particularly important for teenage learners with vulnerable self-images in the FL (Arnold, 2011) for whom the fear of losing face in front of classmates and teacher is acute. Teachers are able to control some aspects of the emotional atmosphere in the classroom but not all, including their attitudes toward students: Dewaele and Mercer (2017) found that 513 EFL/ESL teachers’ attitudes towards their learners were positively influenced by their trait Emotional Intelligence, their length of professional experience, their level of English proficiency, and their (female) gender. A positive atmosphere is impossible if the subject matters of the FL classes are perceived by FL learners to be unappealing, irrelevant and unengaging (Arnold, 1999). Dewaele (2005, 2011, 2015) has argued that routine, boredom, and lack of engagement are fatal in FL classes. The teachers are not necessarily to blame as they often have to follow strict guidelines about course material and delivery (Brophy, 2010). Dewaele (2015) pleaded for teachers to have the liberty to do unexpected, challenging, and funny things in their classrooms. What emerges from the literature review is that students constantly experience both negative and positive emotions in the FL classroom, and these are caused by a range of learner-internal variables and learner-external variables such as the peer group, teachers and their pedagogical practices, and the resulting classroom environment. Some of the independent variables interact and some may weigh more heavily on levels of FLCA and FLE for some students. The study by Dewaele et al. (2017) listed the learner-internal and the teacher-centred variables affecting FLE and FLCA within a specific age range and a single educational context. What remains to be investigated is to what extent the relationship between FLE and FLCA remains constant over time, whether mean levels of FLE and FLCA change and whether the weight of learner-internal and learner-external variables in predicting FLCA and FLE shifts over time. Does the relationship between FLE and FLCA change over time in secondary school? Do levels of FLE and FLCA change over time in secondary school? Are levels of FLE and FLCA predicted by the same independent variables at different points in time in secondary school? 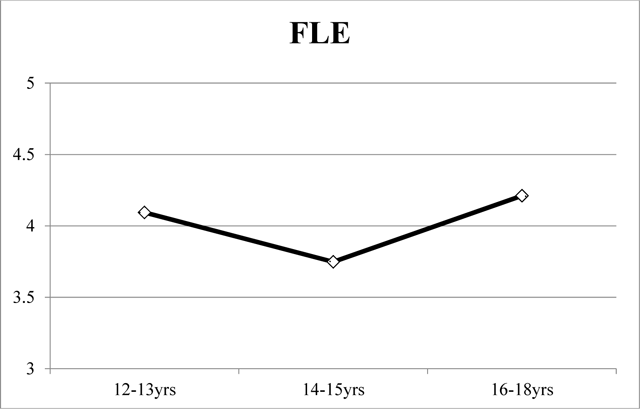 Does the effect of gender on FLE and FLCA change over time in secondary school? The study of a FL is compulsory in UK public-sector maintained schools at Key Stage 3 only (pupils aged 11–14). At Key Stage 4 (pupils aged 14–16) an FL has to be offered by the school but it is no longer compulsory (https://www.gov.uk/national-curriculum/key-stage-3-and-4). FL pupils in British secondary schools face two national tests which are high stakes for themselves and for their schools. The results determine pupils’ admission into Sixth Form colleges or universities and constitute the basis for the calculation of national league tables which play a crucial part in the prestige of the schools. Key Stage 4 pupils are preparing the national General Certificate of Secondary Education (GCSE) exams which involve a strict programme and a fair amount of stress for pupils and teachers. The majority of pupils sitting their GCSE exams in the UK are 16 years old but at Westminster School three quarters of pupils sit their IGCSE2 French a year early, at 15. Pupils are under pressure from parents and school to perform to an expected level and meet targets. FLs are no longer compulsory at Advanced Level (A-Level), where pupils choose three or four subjects to study during the last two years of school, and which they usually sit at the end of their schooling, aged 18. However, teachers and pupils are under an equal amount of pressure as universities typically make conditional offers to secondary school pupils who are in their final year, based on pupils’ personal statement, GCSE results, predicted A-level results, and sometimes university entrance tests and interview performance. A conditional offer for a language or linguistics degree at Oxford is typically “AAA”, and for Cambridge it typically is “A*AA”, meaning a very high score for three courses. Schools are eager to highlight how many of their former pupils obtained “A” scores and how many went on to prestigious universities. A total of 189 secondary school pupils (49 females, 140 males) participated in the study. They came from two schools in Greater London: 63 pupils were from Dame Alice Owen’s, a semi-selective state school in Potters Bar, and 126 pupils were from Westminster School, an independent boarding and day school within the precincts of Westminster Abbey, which is selective and fee-paying. Both schools are amongst the top performing schools in the UK.3 Dame Alice Owen’s employed 16 full-time and part-time FL teachers, Westminster School employed 22 full-time and part-time FL teachers. All pupils in the study were studying FLs, and 85 pupils from Westminster School were also enrolled in courses of Latin and/or Ancient Greek. Participants’ ages ranged from 12 to 18. Three age groups were created: those aged 12–13 (n = 34), aged 14–15 (n = 108) and aged 16–18 (n = 47). Gender distribution was quite different across groups: those aged 12–13 (12 females, 22 males), aged 14–15 (12 females, 96 males), and aged 16–18 (25 females, 22 males). A large majority of participants were British (n = 156), often with double nationalities. One hundred sixty-nine pupils reported to have English as a first language (L1) which was often combined with other L1s. Close to a third of participants (n = 57) reported growing up with more than one language from birth. Participants were also asked about the point they had reached in their FL journey, ranging from Beginner to Lower Intermediate, Intermediate, High Intermediate and Advanced. In age group 1, 18% described themselves as Lower Intermediate, 41% as Intermediate, 21% as High Intermediate and 21% as Advanced. In age group 2, 1% described themselves as Beginner, 12% as Lower Intermediate, 41% as Intermediate, 43% as High Intermediate and 4% as Advanced. In age group 3, 2% described themselves as Lower Intermediate, 38% as Intermediate, 38% as High Intermediate and 19% as Advanced. Pupils compared their own standing in the FL class with that of their peers in their FL class (ranging from “Far below average” (1), “Below average” (2), “Average” (3), “Above average” (4), and “Far above average” (5)). In age group 1 the mean score was 3.9 (SD = 0.73), in age group 2 the mean score was 3.6 (SD = 0.80), in age group 3 the mean score was 3.7 (SD = 0.85). Pupils also reported the results on their last major FL test (in %). In age group 1 the mean score was 89.4 (SD = 10), in age group 2 the mean score was 87 (SD = 10), in age group 3 the mean score was 88 (SD = 9.4). In other words, these were very good FL pupils. The values of relative standing were positively correlated with self-reported results on their last major FL test in age group 1 (r (33) = 0.68, p < 0.0001), age group 2 (r (108) = 0.47, p < 0.0001), and age group 3 (r (46) = 0.42, p < 0.0001). The questionnaire started with a demographics section from which the above information was retrieved. Following this, participants were asked to respond to an item on their attitude towards their first modern FL (as some pupils learned two FLs simultaneously), on a five-point Likert scale. Because very few reported “very unfavourable” attitudes, this level was merged with the next level, i.e. “unfavourable” attitudes (2), followed by “neutral” (3), “favourable” (4) and “very favourable” (5) attitudes. Mean score was 4.1 (SD = 1.1) for age group 1, 3.8 (SD = 1.0) for age group 2, and 4.5 (SD = 0.9) for age group 3. The next question asked whether the pupil had just one or two FL teachers for the FL1. Attitudes towards the one – or first – FL teacher were collected using a five-point Likert scale (ranging from “very unfavourable” (1), “unfavourable” (2), “neutral” (3), “favourable” (4), to “very favourable” (5) attitudes.5 Mean score was 4.1 (SD = 1.0) for age group 1, 3.9 (SD = 1.1) for age group 2, and 4.3 (SD = 0.9) for age group 3. The following question inquired about frequency of use of the FL in class by the FL teacher. Answers ranged from “Hardly ever” (1) to “Not very often” (2), “Sometimes” (3), “Usually” (4), and “All the time” (5). Mean score was 4.1 (SD = 0.8) for age group 1, 3.7 (SD = 1.1) for age group 2, and 4.2 (SD = 0.9) for age group 3. The next four questions inquired about the average proportion of time spent on writing, reading, listening, and speaking by the teacher: the options ranged from 0–10% to 90–100% of the time. Age group 1 reported most speaking and writing, followed by listening and reading, age group 2 reported most writing, followed by reading, listening, and speaking, and age group 3 reported most reading, followed by speaking, writing, and listening. The final question in this section asked how predictable the teacher was during his/her classes (ranging from “Very unpredictable” (1), “Unpredictable” (2), “Neutral” (3), “Predictable” (4), to “Very predictable” (5). Because only 3 participants rated their teacher to be “Very unpredictable”, a single level was created (“Very/Unpredictable”) combining the scores 1 and 2. The predictability mean score was 3.1 (SD = 0.6) for age group 1, 2.4 (SD = 0.8) for age group 2, and 3.2 (SD = 0.9) for age group 3. Pupils were then invited to complete 10 items, which were extracted from the Foreign Language Enjoyment questionnaire (Dewaele & MacIntyre, 2014). They were chosen to capture the reliability of the original scale without sacrificing the reliability of the measurement. They included items reflecting the three FLE dimensions: Social FLE, Private FLE and peer-controlled versus teacher-controlled positive atmosphere in the FL classroom (Dewaele & MacIntyre, 2016). They were based on standard five-point Likert scales with the anchors “Strongly disagree” (1), “Disagree” (2), “Neither agree nor disagree” (3), “Agree” (4), “Strongly agree” (5). All items were positively phrased. A scale analysis of the whole dataset revealed high internal consistency (Cronbach alpha = 0.88). Mean score was 3.9 (SD = 0.6). Another eight items were extracted from the FLCAS and reflected physical symptoms of anxiety, nervousness, and lack of confidence (Horwitz, Horwitz & Cope, 1986). They also captured the reliability of the original scale (Dewaele & MacIntyre, 2014). Two FLCA items were phrased to indicate low anxiety and six were phrased to indicate high anxiety. The low-anxiety items were reverse-coded so that high scores reflect high anxiety for all items on this measure. A scale analysis of the whole dataset revealed high internal consistency (Cronbach alpha = 0.85). Mean score was 2.4 (SD = 0.8). A one-sample Kolmorogov-Smirnov test of the data for age group 1 revealed that the distribution was normal for FLE (KS = 0.11, p = 0.20), and close to normal for FLCA (KS = 0.16, p = 0.05). A look at the scatterplots of the data showed a Bell curve with a skew toward scores on the positive end of the distribution for FLE and towards the negative end for FLCA. The data for age group 2 is normally distributed for FLE (KS = 0.08, p = 0.10) and close enough to normal for FLCA (KS = 0.09, p = 0.04) with a similar distribution pattern. The data for age group 3 is close enough to normal distribution for FLE (KS = 0.11, p = 0.03) and normal for FLCA (KS = 0.10, p = 0.20) with a similar skew toward the high end for FLE. The questionnaire was completely anonymous: no names of participants or their teachers were collected. After the research design and questionnaire obtained approval from the Dean and the Ethics Committee of the school of Social Sciences, History, and Politics at Birkbeck, the headmasters of Westminster School and Dame Alice Owen’s School were contacted to obtain their approval. The research design was presented and explained to the Headmasters and the FL teachers at Dame Alice Owen’s and Westminster School. They agreed after internal consulation. Consent was obtained in two stages: parents were contacted by the school to explain that their children would be invited to participate in a survey on affective variables in the foreign language classroom. They were invited to contact the researchers to obtain extra information. A couple of parents did so, and none opted out of the survey. Next, the parents received an email in which they were asked to invite their child to participate in the study. The pupils’ individual consent was obtained at the start of the survey. The questionnaire was posted online using Googledocs. A Pearson correlation analysis revealed a non-significant negative correlation between FLE and FLCA in age group 1 (r (46) = –0.185, p = ns), a significant negative correlation between FLE and FLCA in age group 2 (r (107) = –0.190, p < 0.048), and a non-significant negative correlation between FLE and FLCA in age group 3 (r (33) = –0.292, p = 0.094). In other words, higher levels of FLE seem to be linked to lower levels of FLCA but only in age group 2, where both dimensions share 3.6% of variance, a small effect size (cf. Plonsky & Oswald, 2014, p. 889). A repeated measures analysis of variance (ANOVA) revealed that FLE changed significantly over time (2, 188) F = 11.6, p < 0.0001, η2 = 0.11 (see Figure 1). It started quite high for age group 1, dropped for age group 2, and increased to its highest level for age group 3. A Tukey post hoc analysis revealed that the difference between age group 1 and 2 was significant (p < 0.009), but the difference between age group 1 and age group 3 was not significant (p = ns). Finally, the difference between age group 2 and age group 3 was highly significant (p < .0001). The effect of time on levels of FL. No significant effect of time emerged on FLCA (2, 188) F = 0.04, p = ns (see Figure 2) and none of the post hoc analyses were significant. The effect of time on levels of FLCA. A preliminary correlation analysis allowed us to identify the independent variables that were significantly linked to FLE and FLCA (see Table 1). The variables that had a significant relationship with the dependent variables were then included in a series of multiple stepwise regression analyses (see Table 2). Pearson correlations analyses between independent variables and FLE and FLCA in the three age groups. Multiple stepwise regression analyses to identify the best predictors of FLE and FLCA in the three age groups. The analysis of age group 1 revealed a single significant predictor of FLE, namely relative standing in the class, explaining 25% of variance. Only one significant predictor emerged for FLCA, namely the point pupils had reached in their FL journey, explaining 22% of variance. In other words, FLE depended most on learners’ standing in the social hierarchy in the class while their FLCA was linked to how advanced they were in the FL, with those at the start of their FL journey feeling much more anxious. In contrast, the multiple stepwise regression analyses of age group 2 revealed multiple significant predictors for FLE explaining 44.6% of variance and two significant predictors for FLCA explaining 20.8% of variance. The attitude towards the FL was the strongest positive predictor of FLE, followed by attitude towards the teacher, unpredictability of the teacher and the number of languages known. FLCA was mostly predicted by learners’ relative standing in the class and to a smaller extent by their position in their FL journey (from beginner to advanced). The analysis of age group 3 revealed that a positive attitude towards the teacher was the only significant predictor of FLE, explaining 44.5% of variance. Relative standing in the class was the strongest predictor of FLCA, followed by teachers’ predictability explaining another 30% of variance. In other words, pupils feeling below average with highly predictable teachers experienced significantly more anxiety. A final series of independent t-tests showed that females in age group 1 reported significantly more FLE (Females Mean = 4.3, SD = 0.36, Males Mean = 4.0, SD = 0.53) (t(32) = 2.2, p < 0.032). No significant differences were found for FLCA: (Females Mean = 2.4, SD = 0.88; Males Mean = 2.2, SD = .77) (t(32) = 0.78, p = ns). No significant gender differences were found in age group 2 for FLE: (Females Mean = 3.9, SD = 0.63, Males Mean = 3.7, SD = 0.59) (t(106) = 1.2, p = ns) nor FLCA: (Females Mean = 2.7, SD = 0.87; Males Mean = 2.4, SD = 0.65) (t(106) = 1.6, p = ns). No significant gender difference was found in age group 3 for FLE (Females Mean = 4.3, SD = 0.46; Males Mean = 4.1, SD = 0.80) (t(45) = 0.74, p = ns). However, female participants did report significantly more FLCA (Females Mean = 2.7, SD = 0.93; Males Mean = 2.1, SD = 0.81) (t(45) = 2.0, p < 0.049). The first research question focused on a possible change in the strength of the relationship between FLE and FLCA across age groups. Correlation analyses revealed a negative relationship between both dimensions across the three age groups, although this difference was only significant in age group 2. In other words, the relationship is quite stable over time. This further reinforces the argument that FLE and FLCA do not represent opposite points on a single classroom emotion continuum. As Dewaele and MacIntyre (2014) argued, FLE and FLCA are not the two faces of Janus at opposite ends of a single dimension but represent conceptually distinct dimensions which tend to be negatively correlated with each other though with little overlap. In other words, pupils with high FLE may tend to experience lower FLCA but it is perfectly possible for pupils to experience both high FLCA and high FLE, or an absence of both (Dewaele et al., 2016). The second research question dealt with changes in levels of FLE and FLCA as pupils progress through secondary school. 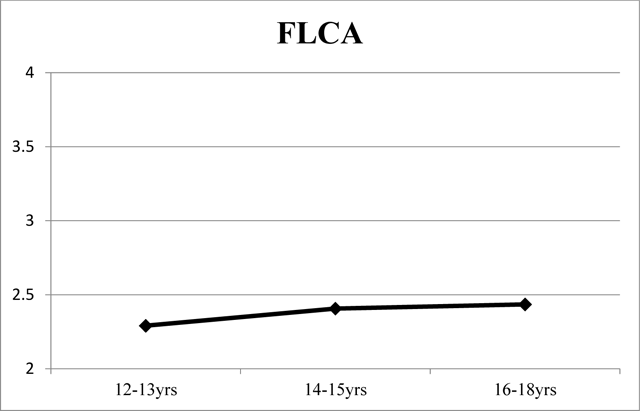 While FLCA was found to remain stable, FLE increased overall, despite a dip in age group 2. The finding of the increase in FLE corresponds with the finding in Dewaele and MacIntyre (2014) with older participants (the range went from pre-teen to participants in their sixties or above) reporting more FLE. Where the pattern differs is the gradual drop in FLCA among older learners, after a peak in teenage years. We assume that in the present sample FLCA levels were still at ceiling level. Dewaele et al. (2016b) – who used the same database as in the present study – attributed the dip in FLE among the 15-year-olds to the focus on the preparation of the high-stake GCSE exams. Levels of FLCA were not linked to participants’ age. The third research question allowed us to dig deeper in the interactions between various independent variables and levels of FLE and FLCA. A first striking result was that fewer independent variables predicted levels of FLE and FLCA in age groups 1 and 3 compared to age group 2. The emotions that learners experienced in age group 1 were unrelated with attitudes towards the FL or the teachers and their classroom behaviour but linked to their personal assessment of their relative standing in the group and their position in their FL learning journey. These two independent variables explained only about a quarter of the variance. The situation was completely different in age group 3, where the attitude towards the teachers strongly predicted FLE – but not FLCA. Anxiety levels of these pupils were linked (like their younger peers) to their relative standing in the class but also, unexpectedly, to teachers’ predictability. In other words, the emotions of age group 3 were much more linked to the teacher compared to the emotions experienced by pupils in age group 1. Age group 2 stands out for the number of independent variables linked to FLE and FLCA. It also occupies an intermediate position between age groups 1 and 3 in the type of independent variables that predict FLE. Attitudes towards the teacher explain a fair amount of variance but not as much as attitudes towards the FL (which play no significant role in age groups 1 and 3). Teachers’ behaviour is also linked to FLE as well as the pupil’s own degree of multilingualism. FLE depends thus on internal characteristics of the learner, characteristics of the teacher and characteristics of the FL. The predictors of FLCA in age group 2 had more similarities with age group 3, namely learners’ relative standing, with the position reached by pupils in their FL journey as an additional predictor (like in age group 1). A striking pattern is also that the independent variables seemed to predict much more variance in FLE than in FLCA. This reinforces the view expressed in Dewaele et al. (2016b) that teachers can be more effective in boosting FLE than in fighting FLCA. By creating a positive emotional classroom atmosphere (cf. Arnold, 1999; 2011), pupils’ FLE will increase automatically and their FLCA levels should drop. The teachers cannot eradicate FLCA because they are not the main source of it (in the current database). Pupils are worried about their relative standing in the group, so the main source of anxiety is the judgment of the peers. The final research question dealt with the effect of gender on FLE and FLCA across age groups. This effect turned out to be weak and quite scattered with females in age group 1 reporting more FLE and female participants in age group 3 reporting more FLCA. No gender differences emerged in age group 2. It would be unwise to speculate about change over time with such microscopic differences. We are perfectly aware of the limitations of the present study. The first limitation is linked to self-selection. All pupils were contacted through their parents but only a fraction filled out the questionnaire. This may have been caused by a lack of interest from the parents or by pupils who did not feel strongly enough about their FL classes to spend 20 minutes on a detailed questionnaire about their FL classroom experiences. The upside is that volunteers provide better quality data (Wilson & Dewaele, 2010), the downside is that we cannot claim that our participants constitute a representative sample of the FL learners in these two schools. The second limitation is that a pseudo-longitudinal study is not really a longitudinal study though it can provide researchers with glimpses of change over time. Because our participants came from two London schools that had been recruiting following the same admission criteria for the last decade, we can claim that the socio-educational profiles of pupils were very similar across age groups. They were taught by the same cohort of teachers using similar guidelines for the teaching of FLs. Ideally sample size would have been more balanced in the three age groups and gender more evenly distributed in age groups 1 and 2. We also realise that the nature of age groups 2 and 3 differs from age group 1 in that the older pupils had elected the FL for GCSE up to A-level. In other words, these were pupils who were more enthusiastic about FLs than average in their school and more likely to have higher levels of FLE compared to pupils in age groups 1 where there was no choice in studying a FL. Despite this, the levels of FLCA remained stable across age groups, suggesting that as learners age and become more advanced in their FL, their levels of FLCA do not drop. One possible explanation is that FLCA is more strongly predicted by personality traits than FLE. In a study on 750 adult FL learners from around the world, Dewaele and MacIntyre (2016b) found that neuroticism predicted 28% of variance in FLCA, followed by relative standing in the group (8%) and higher levels of introversion (3% of variance). In contrast, FLE was mostly predicted by attitude towards the teacher (23% of variance), cultural empathy (8% of variance) and friendliness of teacher (3% of variance). We explained in footnote 1 that carrying out a true longitudinal study, in which a cohort of 11-year-old pupils would be followed over a seven-year period, could produce excellent data but would probably also stretch the willingness to participate by both pupils and school authorities. Moreover, the sample would be relatively small at the start and would probably suffer from considerable attrition over time. It would require considerable stamina and optimism on the researchers’ part. The present study was based on a pseudo-longitudinal design which allowed us to compare FLE and FLCA and their relationships with independent variables in three “slices” of 189 secondary school pupils: 12–13-year-olds, 14–15-year-olds and 16–18-year-olds. These slices represented a stage in the FL development of these pupils. The weak negative relationship between FLE and FLCA remained quite constant over time. FLE showed the expected significant upward trend after a small dip in age group 2 while FLCA remained unchanged. What emerged from the statistical analyses was that beneath the relatively smooth surface of FLE and FLCA scores, various psychological and sociobiographical variables were in a tug of war over pupils’ emotions. Different variables predicted different amounts of variance in FLE and FLCA over time. The effect of the teacher grew over time on FLE but not on FLCA. The effect of relative standing in the group remained quite stable on FLCA. Gender had a limited effect. To conclude, the configuration of factors that underlie our participants’ classroom emotions evolve at different speeds over time. 1Hyland, Meng and Hanford (2013) pointed out that pseudo-longitudinal research is a practical alternative to longitudinal research that is hard to carry out for more than one or two years. In pseudo-longitudinal research “samples of learner language are collected from groups of learners of different proficiency levels at a single point in time. A longitudinal picture can then be constructed by comparing the devices used by the different groups according to their proficiency” (Ellis & Barkhuizen, 2005, p. 97). In the present study we look at learners’ age rather than proficiency level to build an image of changes that take place over time. 2The International General Certificate of Secondary Education (IGCSE) is an English language curriculum offered to pupils to prepare them for International Baccalaureate, A-Level and BTEC Level 3 (which is recommended for higher tier pupils). 3Dame Alice Owen’s School reported that 81% of all grades were awarded A*–B at A-level in 2015 (with 205 pupils participating in the exams). (http://www.damealiceowens.herts.sch.uk/sixth_form/results.html). Westminster School reported that 97% of all grades were awarded A*–B at A-level in 2015 (with 583 pupils participating in the exams). 4The rank order corresponds to national figures for the 23,031 A-level entries in the UK in 2015, with 45% of pupils choosing French, followed by Spanish (38%) and German (17%) (http://www.all-languages.org.uk). 5Because of the anonymity it is impossible to know how many different teachers the participants commented on. Considering that there were sufficient numbers of participants from all year groups in both schools, we assume that our participants provided us with reports of actual teacher behaviour of close to 38 teachers. We would like to thank Dr Davison, the Headteacher, the Head of Languages, Mrs Davies and the teachers of Dame Alice Owen’s as well as the Head Master of Westminster School, Mr Derham, the Head of Languages, Dr Witney, and the language teachers for allowing us to contact their FL pupils. Thanks also to the pupils’ parents and the pupils themselves for their collaboration in this project. Winner of the best JESLA paper for 2017. Arnold, J. ed. (1999). Affect in Language Learning. Cambridge: Cambridge University Press. Arnold, J. (2011). Attention to affect in language learning. Anglistik. International Journal of English Studies 22: 11–22. Arnold, J. and Fonseca, C. (2007). Affect in teacher talk In: Tomlinson, B. ed. Language Acquisition and Development. London: Continuum, pp. 107–121. Baider, F., Cislaru, G. and Coffey, S. (2015). Apprentissage, enseignement et affects. Le langage et l’homme 50(L1): 3–6. Berdal-Masuy, F. and Pairon, J. (2015). Affects et acquisition des langues. Le langage et l’homme 50(L2): 3–8. Boudreau, C., MacIntyre, P. D. and Dewaele, J.-M. (). Enjoyment and anxiety in second language communication: An idiodynamic approach. Studies in Second Language Learning and Teaching, (to appear). Brophy, J. (2010). Motivating Students to Learn. 3rd ed New York – London: Routledge. de Bot, K. (2016). Multi-competence and dynamic/complex systems In: Li, Wei, Cook, V. V. (eds. ), The Cambridge Handbook of Linguistic Multi-competence. Cambridge: Cambridge University Press, pp. 97–124. Dewaele, J.-M. (2011). Reflections on the emotional and psychological aspects of foreign language learning and use. Anglistik. International Journal of English Studies 22: 23–42. Dewaele, J.-M. (2015). On emotions in foreign language learning and use. The Language Teacher 39: 13–15. Dewaele, J.-M. and MacIntyre, P. D. (2016a). Foreign Language Enjoyment and Foreign Language Classroom Anxiety. The right and left feet of FL learning? In: MacIntyre, P. D., Gregersen, T. and Mercer, S. eds. Positive Psychology in SLA. Bristol: Multilingual Matters, pp. 215–236. Dewaele, J.-M., MacIntyre, P. D., Boudreau, C. and Dewaele, L. (2016). Do girls have all the fun? Anxiety and Enjoyment in the Foreign Language Classroom. Theory and Practice of Second Language Acquisition 2(1): 41–63. Dewaele, J.-M. and Mercer, S. (2017). Variation in ESL/EFL teachers’ attitudes towards their students In: Mercer, S. and Kostouleas, A. eds. Teacher Psychology in Second Language Acquisition. Bristol: Multilingual Matters. Dewaele, J.-M., Witney, J., Saito, K. and Dewaele, L. (2017). Foreign language enjoyment and anxiety in the FL classroom: the effect of teacher and learner variables. Language Teaching Research, DOI: https://doi.org/10.1177/1362168817692161 (online first). Dörnyei, Z. and Ryan, S. (2015). The Psychology of the Second Language Learner Revisited. New York: Routledge. Dulay, H. and Burt, M. (1977). Remarks on creativity in language acquisition In: Burt, M., Dulay, H. and Finnochiaro, M. eds. Viewpoints on English as a Second Language. New York: Regents, pp. 95–126. Ellis, R. and Barkhuizen, G. (2005). Analysing Learner Language. Oxford: Oxford University Press. Geert, P. L. C. van . (1994). Dynamic Systems of Development. Change between Complexity and Chaos. New York: Harvester Wheatsheaf. Gregersen, T. and MacIntyre, P. D. (2014). Capitalizing on Individual Differences: From Premise to Practice. Bristol: Multilingual Matters. Horwitz, E. K. (2017). On the misreading of Horwitz, Horwitz, and Cope (1986) and the need to balance anxiety research and the experiences of anxious language learners In: Gkonou, C., Daubney, M. and Dewaele, J.-M. eds. New Insights into Language Anxiety: Theory, Research and Educational Implications. Bristol: Multilingual Matters, pp. 31–47. Hyland, K., Huat, C. M. and Handford, M. eds. (2013). Corpus Applications in Applied Linguistics. London: Bloomsbury. Krashen, S. (1982). Principles and Practice in Second Language Acquisition. Oxford: Pergamon Press. MacIntyre, P. D. (2017). An overview of language anxiety research and trends in its development In: Gkonou, C., Daubney, M. and Dewaele, J.-M. eds. New Insights into Language Anxiety: Theory, Research and educational implications. Bristol: Multilingual Matters, pp. 11–30. MacIntyre, P. D., Gregersen, T. and Mercer, S. eds. (2016). Positive Psychology in SLA. Bristol: Multilingual Matters. Piccardo, E. (2013). Évolution épistémologique de la didactique des langues: la face cachée des émotions. Lidil 48: 17–36. Schumann, J. (1978). The acculturation model for second-language acquisition In: Gingras, R. ed. Second-Language Acquisition and Foreign Language Teaching. Arlington, Virginia: Center for Applied Linguistics, pp. 27–50.